DESCRIPTION Old Rectory Cottage is an impressive five bedroom family house that has been meticulously modernised and extended in recent years to create a highly individual and stylish home with the finest attention to detail throughout. Set behind a pretty landscaped front garden with a gravelled driveway and five bar gate to the side, the property is accessed via a handsome Oak portico and Oak panelled door which opens into a wonderful entrance reception hallway. This beautiful room gives a fabulous first impression of the superb interior that resonates throughout the house, within this stunning room a handsome bespoke staircase rises to the first floor accommodation and a gorgeous stone fireplace, inset with a wood burning 'Morso' stove provides a lovely focal point. The glorious oak beams, which feature throughout the house, add a hint of character and the super tiled floor make the room perfect for decamping from your country walk and warming by the fire. To the right hand side of the entrance reception a door leads through to chic sitting/family room decorated in subtle modern tones with another gorgeous fireplace and 'Woodwarm' stove. This quiet corner of the house is perfect for relaxing and catching up with a good book or movie time with the kids. 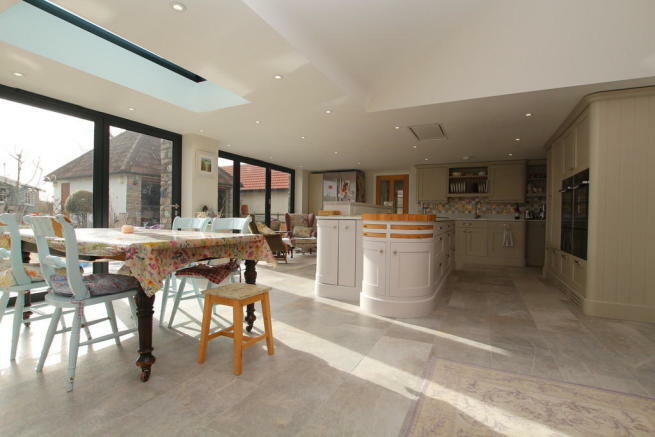 It is however at the rear of the house where the property spectacularly comes into its own, for our current vendors have created what can only be described as a dream kitchen with space for formal/informal dining & family gatherings. Bathed in natural light from two sets of bi-fold doors, which quite literally bring the outside in, this 24'0 x 17'0 room is an absolute triumph of cutting edge design with its main emphasis and focal point being one of entertaining and socialising. 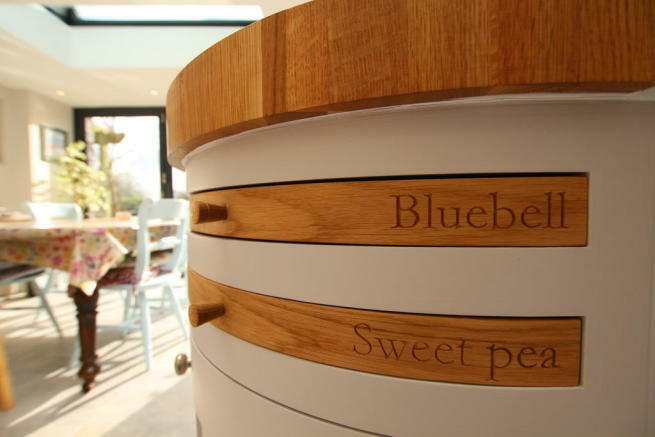 The kitchen itself is designed and crafted of the highest quality materials and features top spec appliances throughout. It is a foodie's heaven with a stunning large larder unit for keeping your home provisions and a combination of solid wood and granite counter tops for preparing your gastronomic delights and Instant hot water Zip tap. 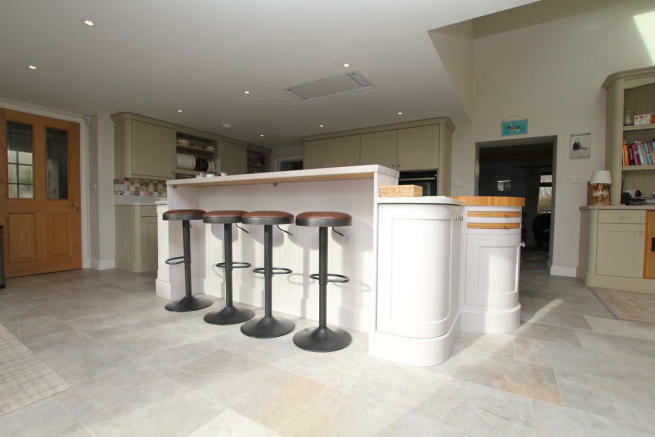 A strategically positioned breakfast bar allows your guests to enjoy their cocktails whilst watching the master chef at work. 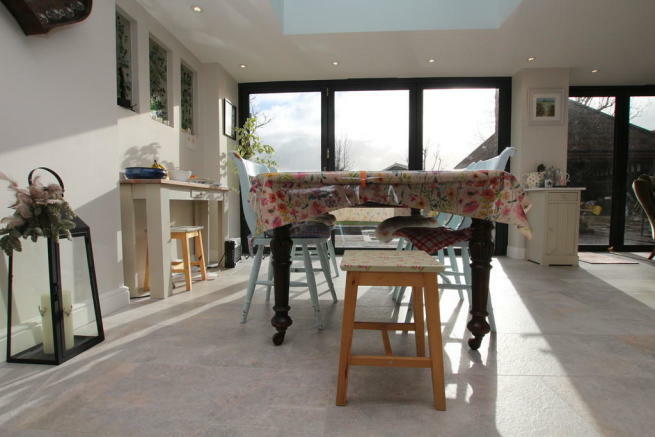 Under floor heating provides a touch of added comfort to the smart travertine floor and a lovely matching welsh dresser compliments the room further and also an electric awning to shade the kitchen in the sun. From the kitchen a door leads through to a useful down stairs w.c and well fitted utility room. 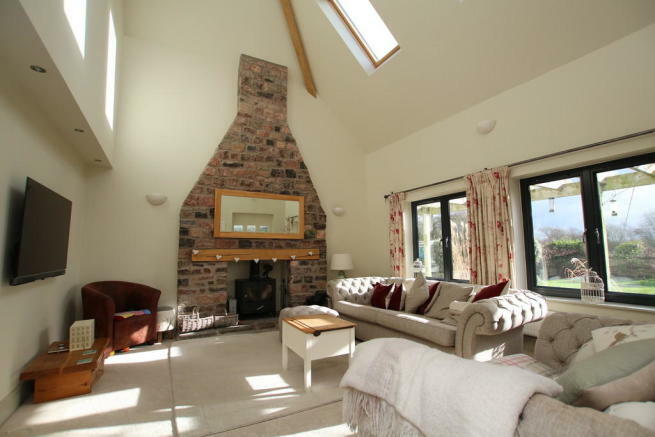 The sitting/drawing room is yet another hugely impressive room, with its vaulted ceiling displaying sharp modern Oak beams with a fabulous stone fireplace rising from floor to ceiling. Three beautiful stained glass windows, which were commissioned by our owners, adorn the connecting wall to the kitchen and add even more individual character to the home. 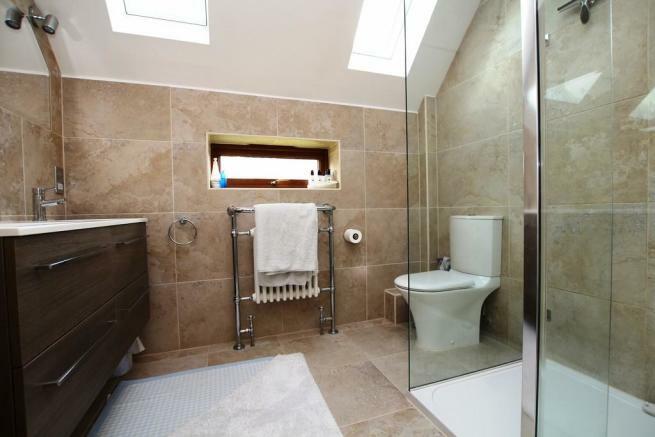 Also, on the ground floor is a study/office and a good sized double bedroom, which also benefits from a well appointed en-suite shower room. With a little adapting this corner of the property could quite easily be made self contained perhaps for use by a dependent relative or indeed an independent teenager. 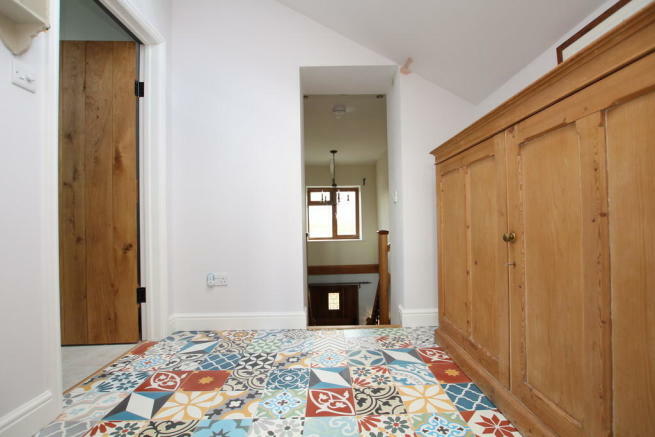 On the first floor are the four remaining bedrooms and it is very clear that no less attention to detail has been afforded to the upstairs rooms than those on the ground floor, with individuality and character throughout. 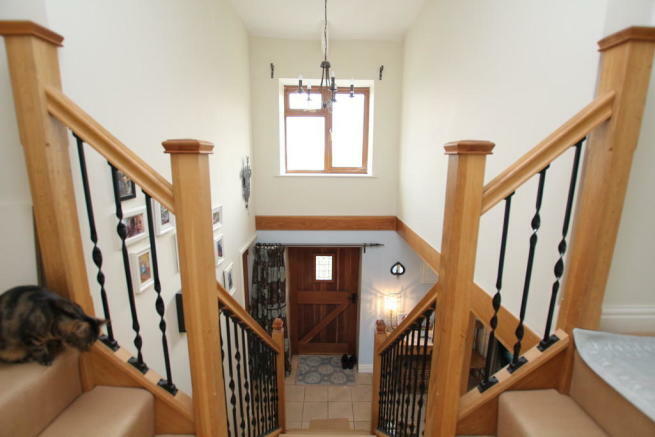 All the bedrooms are accessed off the impressive split level galleried staircase from which there is also a gorgeous inner landing with a stunning Baroque Spanish tiled floor. 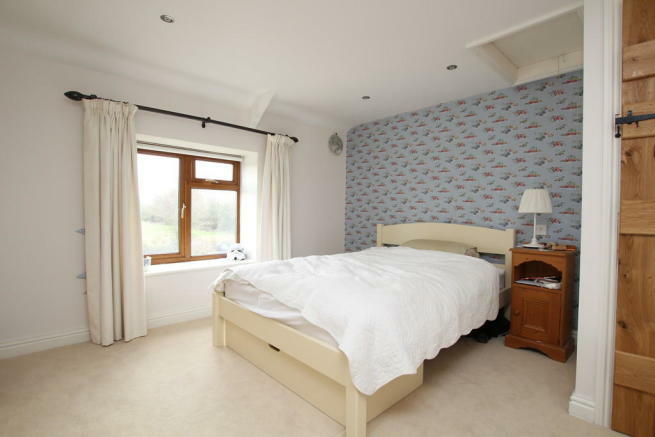 The Master bedroom, which faces towards the front of the house, is a lavish and generously proportioned room with a super en-suite bathroom, with a chic walk in double shower and a cool tiled splash back. 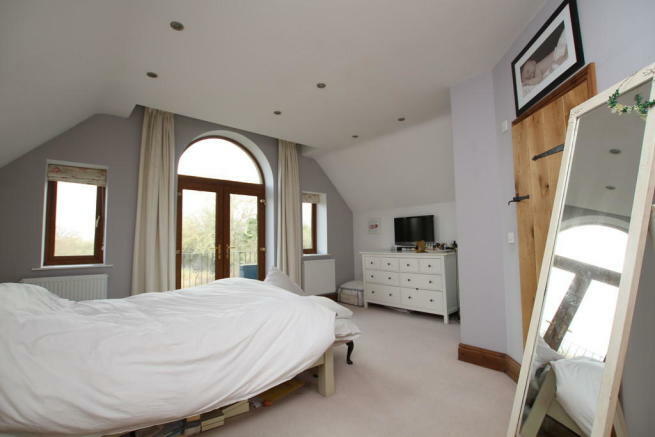 To the front of the bedroom a picturesque arched window sits above double doors which provide access out to a lovely Juliet balcony providing stunning views over the local countryside. 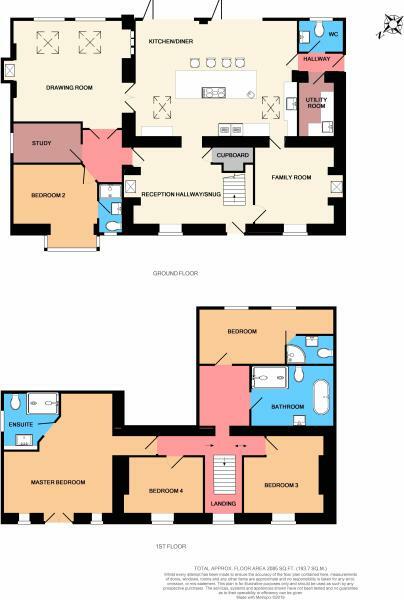 The guest suite (situated to the rear of the house) is another large double bedroom complete with its own modern shower room whilst the two remaining bedrooms share use of a luxurious family bathroom featuring a double shower cubicle and lavish claw foot bath. Outside, the property has the perfect balance of meticulously landscaped entertaining areas and a good sized level lawn which backs onto open fields. The skilfully and artistically designed entertaining terrace is inset with a beautiful minimalist pond and the raw materials used to create the terrace are a patchwork quilt of colourful stone cobbles and recycled timber. A retractable sun awning creates shade for those long hot Summer's days. Beyond the smart gravelled driveway that flanks the right hand side of the house is an attractive stone built double garage with up and over electric doors and power. To the opposite side of the garden is an area of land which belongs to the local parish and for which our homeowners are granted use off, this currently provides a play area for the children with ample space for recreational equipment such as climbing frames, trampolines etc. The rear garden enjoys a South/Westerly aspect and offers superb privacy and a lovely rural outlook. EPC rating F.
DIRECTIONS Travelling on the B3133 from the outskirts of Yatton towards Clevedon, turn left at Kingston Bridge just past The Bridge Inn towards Kingston Seymour. Continue over the bridge into the village and, at the village triangle, continue onto Ham Lane, Old Rectory Cottage can be found past the village church on the left hands side. 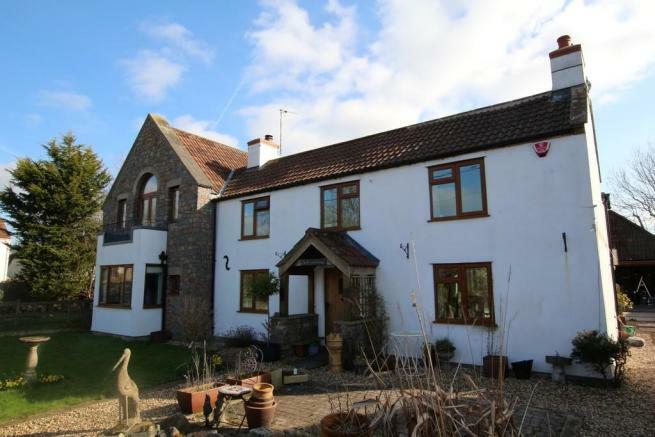 SITUATION The village of Kingston Seymour is an attractive and sought after hamlet between the North Somerset village of Yatton and the Victorian seaside town of Clevedon. A quintessential English country village, with its village green, ancient church and village hall, it is surrounded by countryside with lots of walks and a rural atmosphere, yet Yatton and Clevedon are only a short drive away. Yatton boasts an excellent range of shopping, social and recreational facilities, a bus service to Clevedon and Weston-super-Mare, and a mainline railway station giving access to Bristol and on through the UK. On the other side of Yatton is Cadbury House with its hotel, restaurants, health club and spa. Kingston Seymour also has its own well stocked fishing lakes and has won the 'Best Kept Village Award' on a number of occasions plus a 'National Community Village' award. There is an infants and junior school at nearby Yatton, with secondary schooling at Backwell. Private schools are in the area, at Wraxall, Bristol, Sidcot and Wells. The nearest motorway interchange is at Clevedon, giving national motorway access, and Bristol Airport to the east is some 15-20 minutes drive away. OUR VENDOR SAYS The property is individual and drew us in straight away. 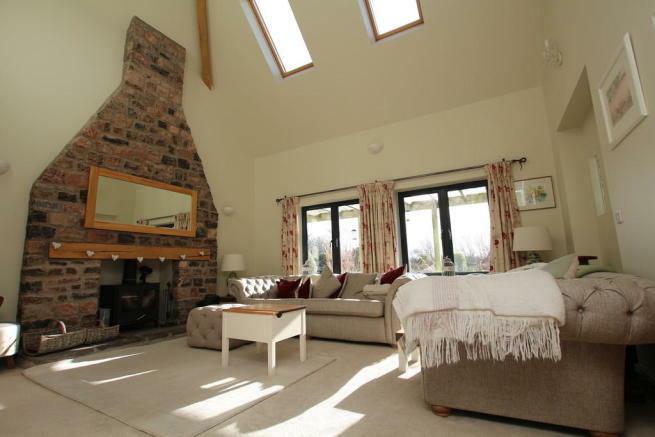 We loved the old aspect of the cottage combined with the tall ceilings of the lounge. The property is south facing and filled with sunlight. Its in a lovely position in the village and nicely set back off the road. The property flows perfectly throughout. 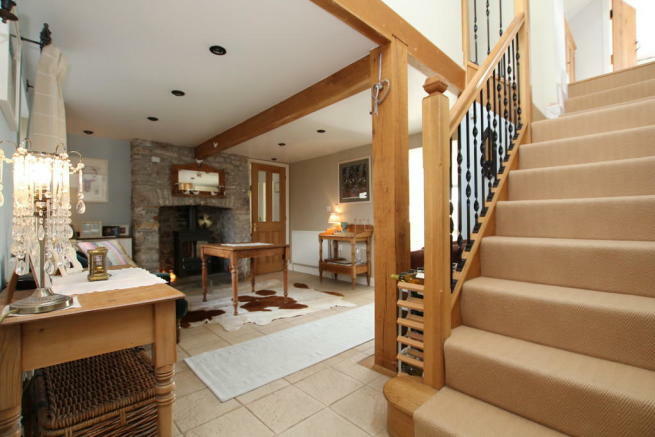 I love the individual aspects of this house, I have loved furnishing it and designing it to the highest specification. WE HAVE NOTICED Simply stunning, this dream home has an interior that would grace even the most stylish of lifestyle magazines. It is very hard to put into words the exceptional quality of the finishing detail in this luxurious bespoke home. You really do need to see this house if you want to be the envy of all your friends and family. Disclaimer - Property reference 100872007946. The information displayed about this property comprises a property advertisement. Rightmove.co.uk makes no warranty as to the accuracy or completeness of the advertisement or any linked or associated information, and Rightmove has no control over the content. This property advertisement does not constitute property particulars. 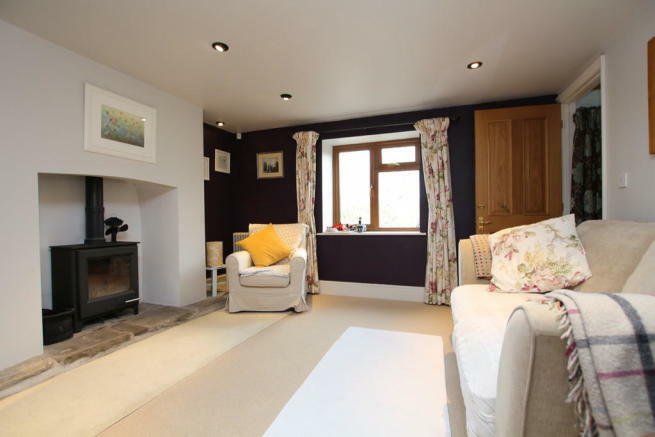 The information is provided and maintained by Debbie Fortune Estate Agents, Congresbury. Please contact the selling agent or developer directly to obtain any information which may be available under the terms of The Energy Performance of Buildings (Certificates and Inspections) (England and Wales) Regulations 2007 or the Home Report if in relation to a residential property in Scotland.